Geared up and ready for a sunset session. 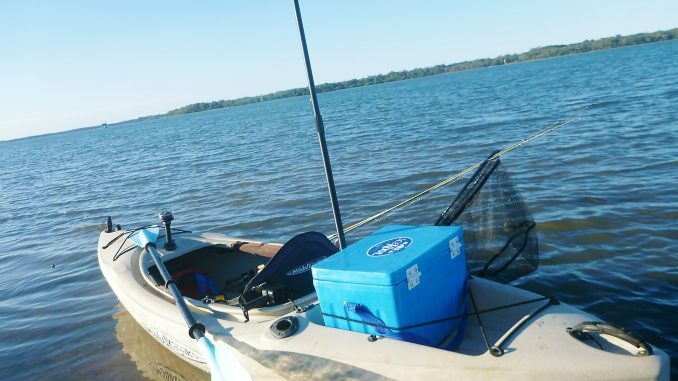 Busy lives can often see us anglers struggling to get out on the water as much as we would like and the ability to make the most of small windows of time is one area where the kayak comes into its own. 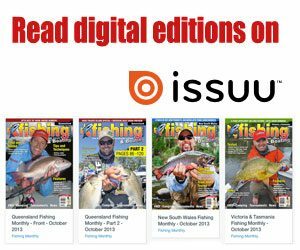 It can be as simple as a kayak, paddle, PDF, rod and reel combo and a dry bag with a bit of safety and fishing gear and we’re on our way… even if we only fish for an hour or two, it can be enough to tame the itchy casting finger and give us our fix. If you’re struggling to find even those small widows of time, then you may have to turn to the dark side. Fishing in the dark, whether it be of an evening or in the wee hours of the morning has its challenges, however it may be the best opportunity you have to sneak a fish in pre or post work, or once the little ones have gone to bed or before they rise for the day. Being able to launch anywhere is an advantage as you can drive to spots that you know hold fish, launch right there and hopefully make the most of the short session. There are a few key safety considerations to take into account when night fishing, along with a few tips that may see you land a few more on your adventures. 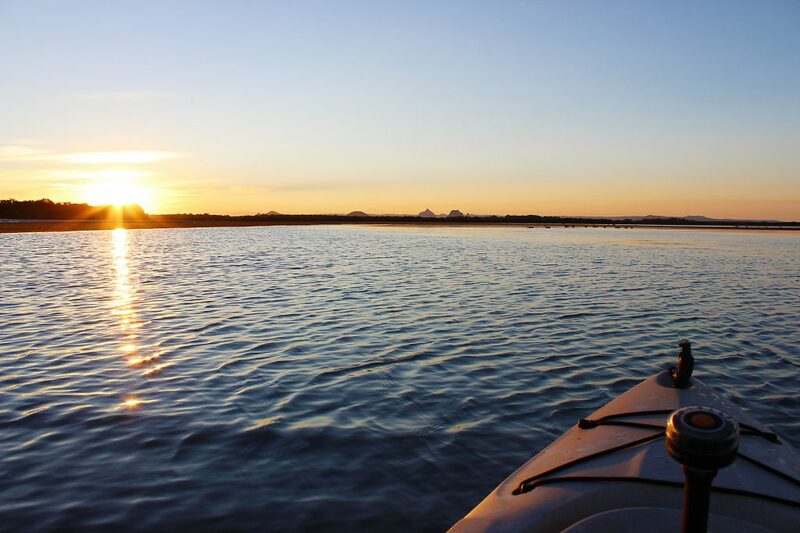 Boat ramps, marinas, bridges and roads running along the waterfront can often provide light for setting up, launching and retrieving your kayak, however a good headlamp will do the trick if you are sneaking into less populated areas. I have had good service from a range of headlamps and if you select a waterproof headlamp from reputable brands you should be set up for your adventures. LED is a must, offering a cleaner, more even white light, lower draw, less heat and much less chance of failure when compared to incandescent or halogen bulbs. Check out a range of headlamps and consider waterproof rating, light output, light distance, weight, batteries required, run time, different light functions offered, such as multiple levels of light output, flashing and different coloured light outputs for night use and map reading. Most of this information will be included on the packaging of quality headlamps. I avoid rechargeable headlamps with the battery enclosed inside the unit, preferring to choose a headlamp with removable batteries, enabling me to carry a spare set of batteries, or rechargeable batteries and not have the worry of limited run times. 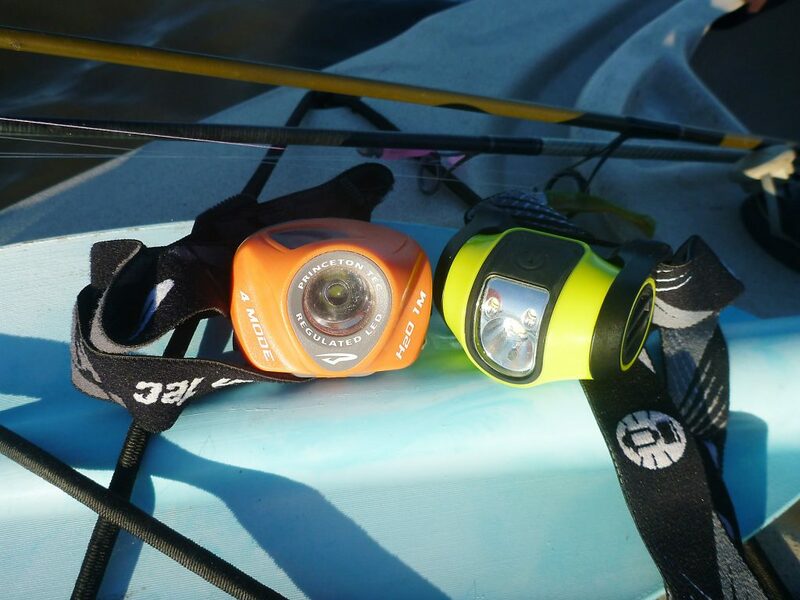 Another preference is for a powerful headlamp that can act as a spotlight when on the water, while having multiple levels of light output, so that I can tame the light down when rigging and working within the cockpit of the kayak. It’s not a bad idea to carry a spare headlamp in your dry bag, just in case, and this can be a cheaper, smaller option that is simply carried as a backup to get you out of trouble, but is also handy when trying to change batteries on your main light. 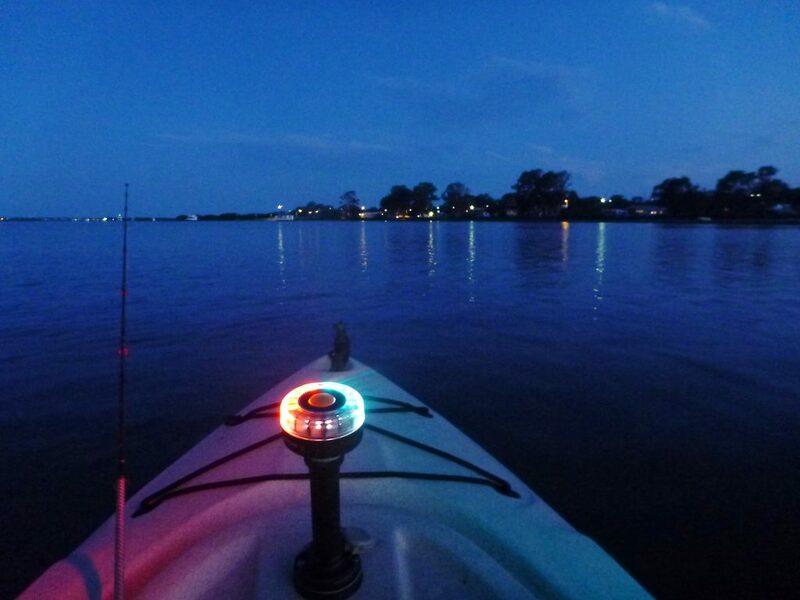 Other options to light up your kayak include mounted lights such as LED strip lighting and deck lighting and I have seen some kayak setups on the water that look like a floating nightclub. The author snaps a selfie after a successful night raid, with one fish kept for dinner. It’s all about being able to see and ensuring that other vessels can see you. 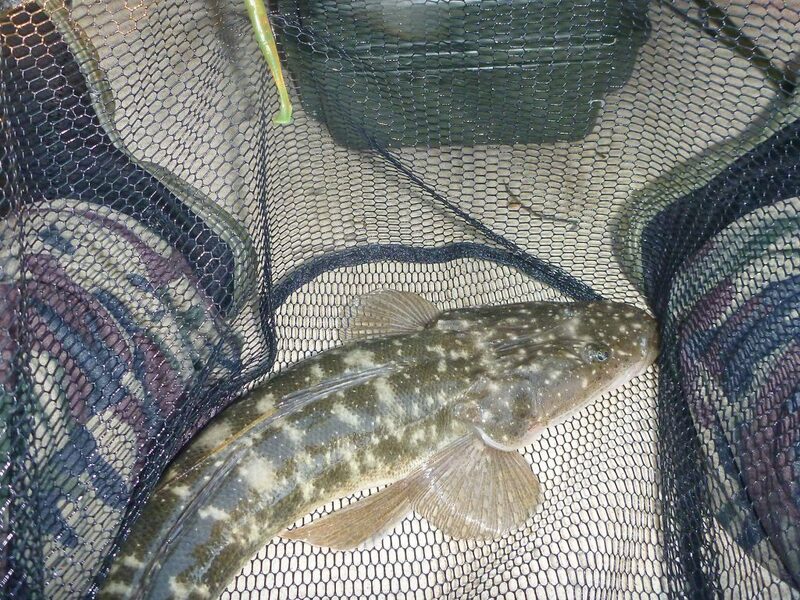 Netting all fish is a good idea in the dark as it makes them easier to handle and release. Quality, waterproof headlamps with multiple light levels are ideal. 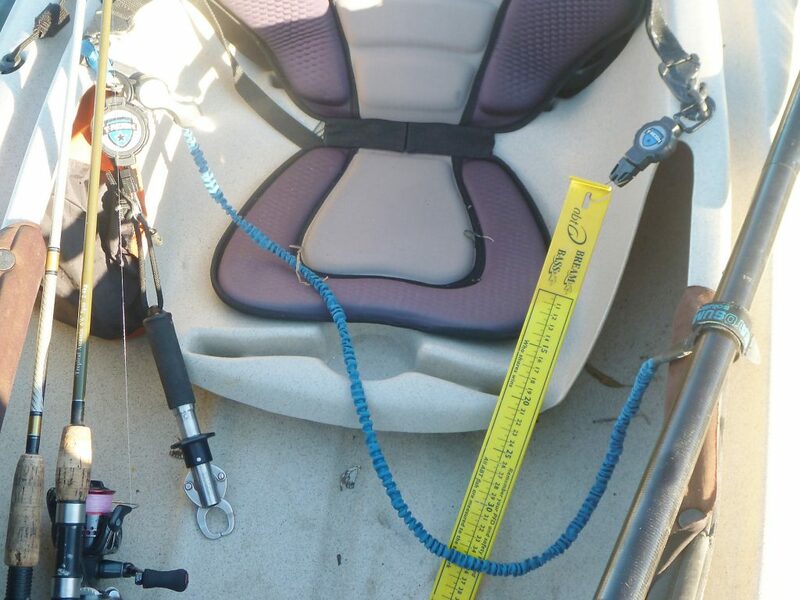 Having an organised deck or cockpit area is essential when darkness falls – net, lip grips, ruler and boomerang tool all leashed within arm’s reach. A pole setup allows the all-round white light to be visible 360° above your seated position. The Railblaza mounting and lighting system makes setup quick and simple. Back on the trolley after a successful sunset session. Anglers aren’t the only ones that enjoy hunting with the advantage of lower light. 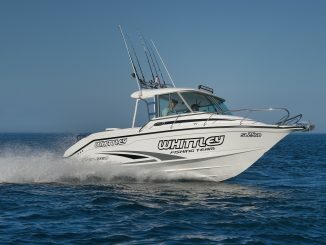 Sunrise and sunset are peak bite times and magic times to be on the water. We can now see what we’re doing, however we also need to ensure that we can be seen. High-vis and reflective clothing is a good idea and I always wear my inflatable PFD that is fitted with large strips of reflective tape. Reflective tape attached to the kayak is another option, and I have seen some nice efforts with reflective names, eyes and teeth displayed on kayaks. Navigation lighting should be fitted if you are paddling and fishing in the hours of darkness. 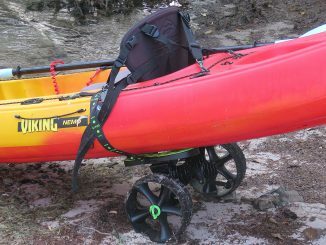 Kayak anglers that spend extended periods on the water in darkness often set up their kayaks with 12-volt lighting systems consisting of a 12-volt battery, switch panel, all-round white light and red/green port and starboard lights. 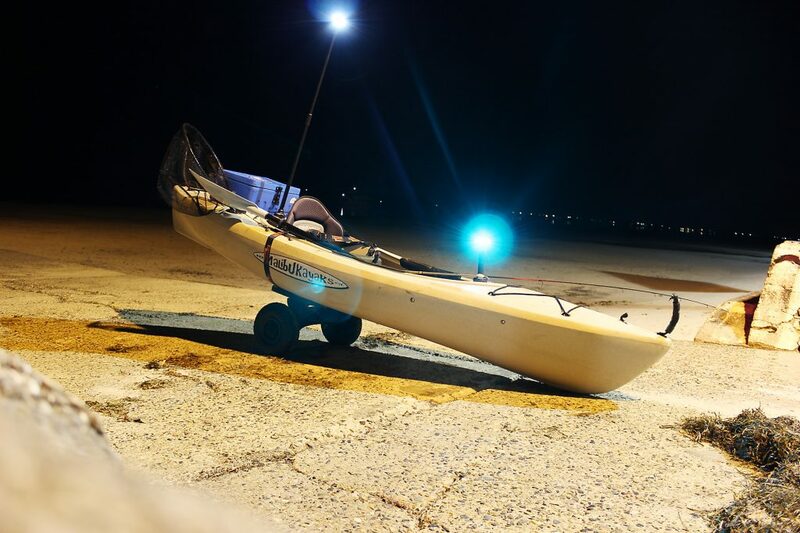 As I often switch between my larger pedal kayak, a smaller sit-on top and a smaller sit-inside kayak, depending on the mission, I have opted for portable lighting that can be simply and easily moved from one kayak to another. When it comes to portable lighting, it’s hard to go past Railblaza’s Illuminate i360 Allround White Navigation Light and the Navilight Port/Starboard (tricolour) Light. 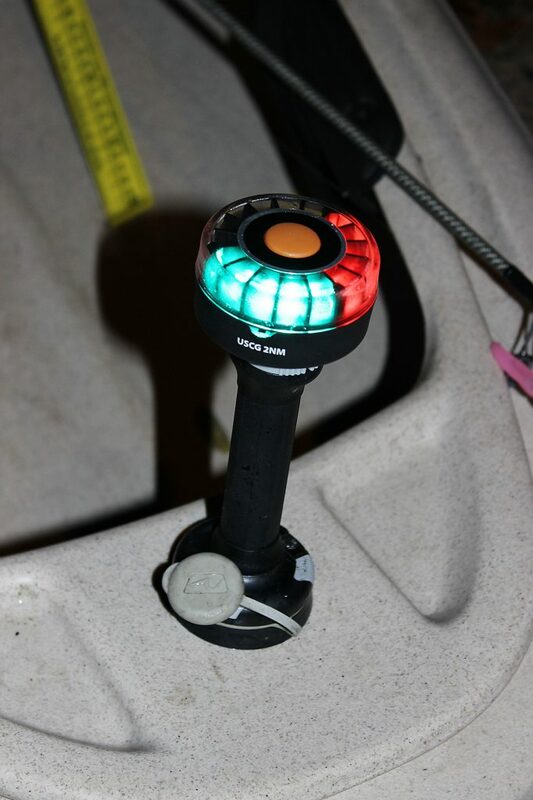 The Navilight has a white stern light, along with red and green, port/starboard lights, all of which can be switched on independently, or you can run red/green together or all three at once. I mount this light in front of me in the kayak on a StarPort Extender and simply turn off the white stern light so that it doesn’t shine back into my eyes. 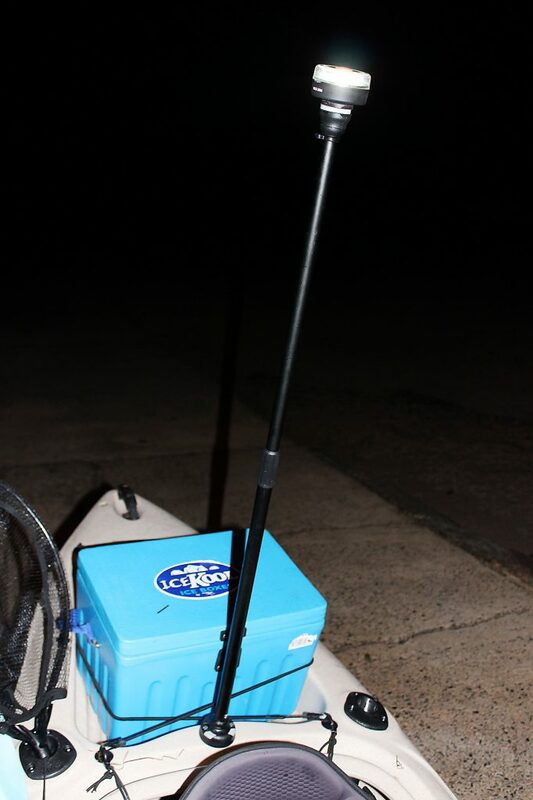 The all-round white light is then mounted behind my seat on a Railblaza TelePole 1000 (new version called an Extender Pole 1000), which elevates the light above my seated position so that it is clearly visible for 360°. These light options are excellent quality, made in NZ, waterproof and float light up if detached and thrown to someone in the water. It is also a good idea to carry an audible signalling device such as a marine safety whistle attached to your PFD or air horn packed in your dry bag and kept within easy reach. 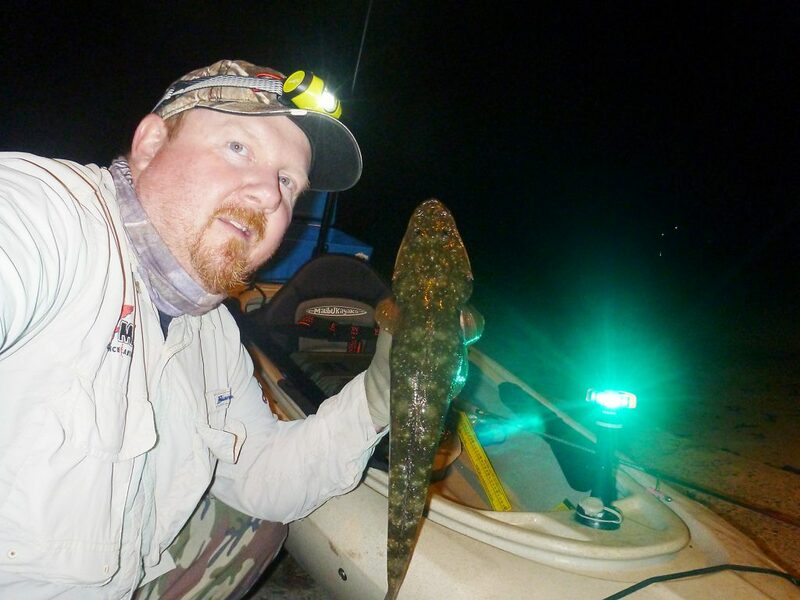 The aquatic world changes at night and it’s amazing how busy swimming areas, crowded boat ramps and bustling rivers that can be tough areas to fish in daylight hours come alive in the dark. Areas that have some form of lighting are the first port of call, as the light attracts bait and predators lurk in the shadows waiting in ambush. 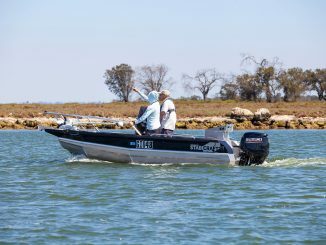 Other prime areas to fish include structure that produces for you in daylight hours, including rocks, oysters, weed beds and snags, along with areas that fish should travel along as they actively hunt and feed, such as mangrove edges, weed edges, points, drains and channel edges. 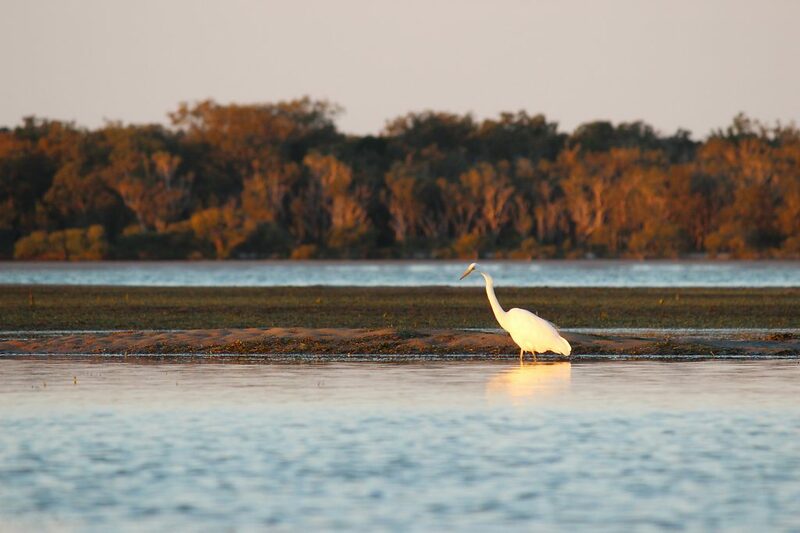 If the tides are high, get up on the flats, as fish can be found hunting in shallow water in low light, making sure that you keep noise to a minimum, especially in shallow water. Freshwater anglers should again look to structure that produces during daylight hours, but don’t forget the shallows as fish move into feed under the cover of darkness. 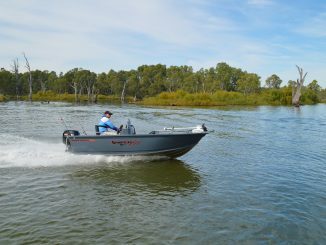 Fish will also more actively hunt in open water and covering plenty of ground with noisy lures can produce results. A common question people ask me is do lures work at night and the answer is simple, yes. 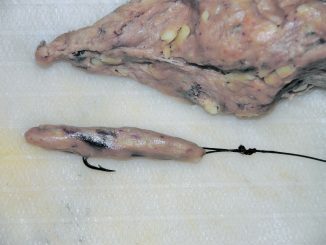 For those who want to fish their favourite baits in the hours of darkness, these will work too and I have had great success at night fishing with live worms and yabbies, flesh baits and mullet gut. Darkness is also a great time to send out a live bait as larger predators often hunt more actively under the cover of darkness. For me, it’s hard to beat actively hunting with a lure though and feeling an interested tap or brutal strike as you are retrieving the lure. When fishing lures in the dark, I prefer lures that make a bit of noise or move a bit of water, including paddle-tail plastics, blades and diving hardbodies for targeting sub-surface predators. I’ll often use plastics such as frogs or paddle-tails on the surface or surface hardbodies such as poppers, walkers and paddlers that create a disturbance for attracting predators that feed on the surface, especially in the shallows. So next time you’re suffering from ‘lackoffishingitis’, take some time to investigate your lighting options, check the tides and pencil in a session on the dark side. Always remember safety first when selecting a location, paddle with a friend when possible, pack your safety kit, select appropriate clothing for the after dark adventure, don’t forget your bug spray and let someone know where you’re heading and when you expect to be home. The aquatic world comes alive after dark and you may be surprised by what you get connected to just metres from your launch point.